Lip Moisture is an all natural lip balm with organic and natural ingredients. 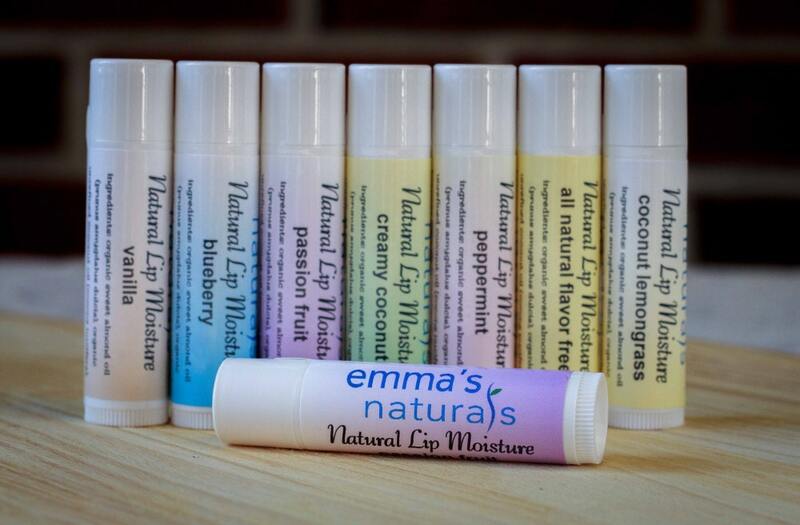 The organic coconut oil and organic sweet almond oil will moisten and protect your lips for hours at a time. We are committed to keep all of our products paraben and preservative free using only the highest quality ingredients. These keep it safe to use on you and the little ones in your life. Try these with the Lip Mask for a truly unique lip softening experience! We have a variety of flavors: Vanilla, Peppermint, Creamy Coconut, Flavor Free, and Coconut Lemongrass, Blueberry and our new summer flavor STRAWBERRY MINT! 5 SIMPLE INGREDIENTS: Organic unrefined coconut oi, organic pure sweet almond oil, shea butter, beeswax, non GMO unrefined vitamin e oil. You can keep your product flavor free or add one of our unsweetened flavor oils.